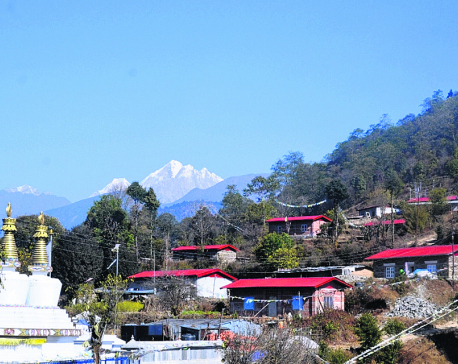 SINDHULI, Dec 29: Thirty-two months after the catastrophic earthquake of 2015, reconstruction has finally been speeded up in Sindhuli. Earlier, locals sidelined the reconstruction of their houses for long. However, most of them have started building their houses of late. As stated by the officers of the Building Division Office (BDO) which falls under the Urban Development Ministry, it has been six months since the long stalled reconstruction has picked up pace. 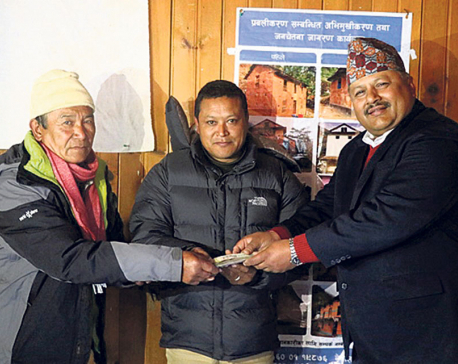 As the government made it mandatory for the quake victims to receive the second tranche of relief grant by mid-January, locals have speeded up the reconstruction due to the fear of losing the grant. The National Reconstruction Authority (NRA) had listed 34,270 damaged houses in the list of service seekers. By now, more than 30, 200 people have signed the agreement. As informed by Durga Ghimire, an engineer at BDO, as many as 30,161 quake victims have received the first tranche by now. Of them, around 7,000 have also been provided with the second installment while about 1,300 have also received the third and the final tranche. As all victims have started constructing their houses, they lament that they are dealing with shortage of technical manpower and construction materials. "If we fail to build our houses within the given deadline, we won't receive the second tranche but we are currently dealing with shortage of manpower," said Lok Bahadur Aal, a local. According to him, the quake victims have started building their homes despite being faced with various problems. Caption: An earthquake resistant house built in Kamalamai Municipality-3, Jalkanya.